Featuring every action hero known to man, from Sylvester Stallone, Arnold Schwarzenegger, Wesley Snipes, Jason Statham and Jet Li, to UFC stars Randy Couture and Ronda Rousey, Expendables 3 was always going to be a hit. However, the plan was to have it become a hit on the big screen before breaking into the home market. Figures gathered by TorrentFreak reveal that more than 100,000 200,000 (update) people have downloaded the presumed ‘DVD screener’ copy using BitTorrent alone, and at one point in excess of 65,000 users were engaged in transfers on a single torrent. Needless to say, the folks at distributor Lionsgate are going to be absolutely furious. While ‘cams’ are an annoyance, most movie-goers won’t want to destroy the movie experience by watching them. High-quality copies like this one are a different matter altogether and the soaring download numbers are a testament to that. Drarbg has accounts on several major torrent sites, including The Pirate Bay, and is one of the most prolific BitTorrent releasers online today. Many presume that this is a single person, but Drarbg has previously indicated that it’s a group of individuals working together as a team. Drarbg, as the name suggests, has affiliations with RARBG, a popular public torrent site. 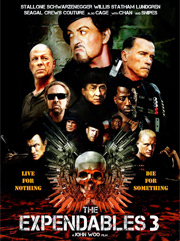 Nu Image, the production company behind all three Expendables titles, sued previous downloaders of its titles. Will history repeat itself? Time will tell…. Update 2: While the Drarbg torrent gained the most traction initially, it appears another torrent was uploaded by another releaser around 20 mins before. c There are 165 comments. Add yours?